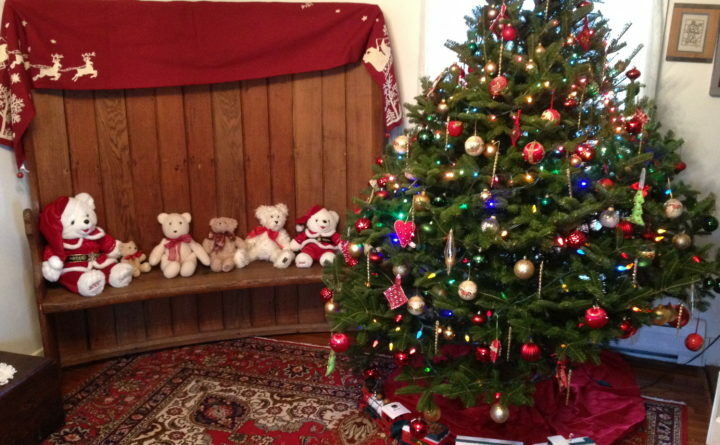 Stuffed toys and a toy train complement the 6-foot Christmas tree in this room in John and Christina Smith's house in Eastport. ‘Tis the season for aggravated allergies. You may have noticed that when the yuletide season rolls around, so do heightened allergy symptoms: sneezing, coughing, itchy eyes, runny nose, even exacerbated asthma. Not to be a Grinch, but it is possible your Christmas tree is to blame. While some people have allergies to pine and cedar pollen, pollen-related allergic reactions to Christmas trees are likely due to fall weeds, whose pollen accumulates on the trees as they wait to be sold. But the more likely culprit, however, is mold. Christmas trees naturally harbor mold spores, which flourish once the tree is moved into your heated home. “Especially if you buy a pre-cut tree you want to know how long it has been sitting at the store and how it’s been stored,” says Dr. Lawrence Kurlandsky, a retired pediatric pulmonologist and allergist. Kurlandsky co-authored a 2011 study that found 53 mold species, of which 70 percent were potentially harmful, living on clippings taken from the Christmas trees of 28 of his colleagues. Kurlandsky says that the term “Christmas tree syndrome,” which is sometimes used to describe the allergic reaction to Christmas tree mold, was borne out of the media storm around his research. You do not have to sacrifice your natural tree, however, if you take the proper steps to manage stray pollen and mold build-up. Before bringing your tree indoors, you can use a leaf blower to remove pollen from your tree. To remove mold, hose your tree down and let it dry thoroughly (Meadows and Kurlandsky both recommend putting it in your garage to dry) before displaying it. Some Christmas tree nurseries also have tree washing services for this purpose. If you are especially sensitive, limit the time that your Christmas tree stays in your house to about a week. The more time your tree spends in your heated home, the more opportunities mold has to proliferate; a 2007 study showed that the levels of airborne mold spores in an apartment increased from 800 spores per cubic meter before the live conifer was brought inside to 5,000 spores per cubic meter after it was in the apartment for two weeks. Since mold spores may accumulate the longer your tree is in the house, consider getting rid of your tree immediately after Christmas. “As soon as you feel like you can get rid of it, get rid of it,” Kurlandsky says. Running an air purifier in the same room as the Christmas tree while it is in the house can also alleviate allergy symptoms from pollen or mold. The right medicine will also keep pollen and mold allergy symptoms in check, but given all the array of allergen possibilities for both real and artificial trees, Meadows recommends consulting an allergist first. “You need to see an allergist and get tested to find out if it’s the fall pollen, mold, or dust,” he says. Meadows and Kurlandsky agree that artificial trees may be a better choice for holiday revelers with especially sensitive pollen or mold allergies, but even fake trees come with their own allergen issues. If they are not stored properly, artificial trees and ornaments can accumulate dust (and sometimes mold, though it is less common) that trigger allergic reactions. Give your artificial tree a thorough dusting outside before displaying it. After the holidays are over, store your artificial tree in a dry area, preferably in lidded plastic tubs, to minimize its exposure to moisture and dust. In the same vein, ornaments and other Christmas decorations harbor dust and mold after a year in storage. Clean all ornaments and lights before putting on the tree, and, like with the artificial Christmas tree, store them in sealed plastic containers.